A 20-year-old female presents with abdominal pain. She is gravid 2, para 1 at 18 weeks gestation confirmed by ultrasound dating. She has had an uncomplicated pregnancy but has had one day of gradual onset abdominal pain with nausea, vomiting and anorexia. How should this patient be managed? What should be considered for the fetus? Though many obstetric complications occur during pregnancy, the pregnant woman is still a woman with all her other organs that can be at risk, regardless of her pregnancy status. Typically, patients with obstetric complications will complain of uterine tenderness, vaginal bleeding and may have abnormal fetal heart tones on monitoring. When signs and symptoms do not support an obstetric cause for the patient’s abdominal pain, it is imperative that the differential is still wide for all other causes. Source: Jang KM et al. The value of 3D T1-weight gradient-echo MR imaging for evaluation of the appendix during pregnancy: preliminary results. Acta Radiol. 2011 Ocr 1; 52(8):825-8. Though the gold standard for diagnosis of appendicitis is CT in the general population, physicians must weigh the risk of delayed diagnosis and rupture with the risk of exposing the fetus to radiation. Ultrasound, where possible, can confirm diagnosis without exposing the fetus to this risk. Like in the nonpregnant patient, diagnosis is based on first identifying the appendix, a blind ended aperistaltic tubular structure that originates from the base of the cecum. The normal appendix has a wall thickness of 2 mm or less. Appendicitis is diagnosed upon seeing an incompressible, blind ended tubular structure with wall thickness of 3 mm or more and an outer anterior-posterior diameter of 6 mm or more.8 Other findings suggestive of appendicitis include presence of fecalith, hyperechoic periappendicular fat, or a peritoneal fluid collection. However, evaluation of the compressibility of the appendix is less sensitive after 35-week gestation due to the gravid abdomen.9 If the appendix is not visualized due to operator experience, body habitus, intraluminal air or distortion of normal anatomy as seen in pregnancy, an ultrasound is equivocal for the diagnosis. MRI has also been recommended by several studies in place of CT to minimize risk of radiation exposure.1 If US is equivocal and MRI can be obtained without delaying care then proceed to MRI rather than CT. Acute pancreatitis occurs in 1% of pregnant women and is often self-limited and conservatively managed.1 Presentation is identical to that in nonpregnant patients and diagnosis is based on elevated lipase and clinical picture. Most commonly, this occurs during the third trimester or immediately postpartum. 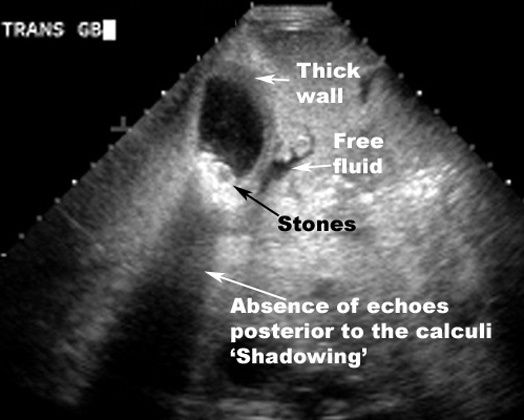 It is thought that the increased incidence in the third trimester is due to increased intra-abdominal pressure by the gravid uterus on the biliary ducts.6 Ultrasound can be useful in identifying complications associated with pancreatitis including common bile duct dilation, cholelithiasis, pancreatic pseudocysts, and abscesses. Generally, a CT is not necessary unless the clinical course is complicated by suspected extensive necrotic pancreatitis or severe pancreatitis. Mainstay of management is no different than pancreatitis in the nonpregnant patient and is primarily supportive care including analgesia, antiemetics, advancing diets as tolerated and maintaining volume status with intravenous hydration. Adnexal torsion is a rare problem but does complicate 1 in every 1,800 pregnancies.14 This is more likely during the first and early second trimester, typically involves the right side, and most commonly is due to the presence of the corpus luteum cyst.14 Presentation will be similar to that of nonpregnant patients and ultrasound is the imagining modality of choice for diagnosis. The transabdominal approach can be used initially for evaluation and becomes more useful at later stages of pregnancy as the ovaries are brought out of the pelvis by the enlarging uterus.15 A transvaginal approach may be needed if the adnexal structures are not well visualized in the transabdominal approach. Doppler flow should be used to evaluate for torsion though the presence of flow does not exclude the diagnosis. Management is surgical and requires consultation with OBGYN. Table directly from: Lew M, Klonis E. Emergency Management of eclampsia and severe pre-eclampsia. Emerg Med (Fremantle). 2003 Aug; 15(4):361-8. Delays in care of the pregnant female with non-obstetric emergencies arise both from delays in diagnosis due to vague symptoms and atypical presentation and also from delays in obtaining appropriate and definitive diagnostic imaging. Though radiation exposure does place risk on the development of the fetus and future cancer risks of the child, a fetus absorbs 3.5 rad when exposed to a typical CT scan of the abdomen and pelvis and 0.02 to 100 mrad with conventional chest and abdomen radiographs.19 These levels are much lower than the radiation dose threshold thought to cause morbidity and mortality to the fetus.1,19 As such, with good clinical gestalt, delays in diagnosis and in obtaining definitive workup should be avoided to improve outcomes for the pregnant woman. The gravid uterus can mask the signs of peritoneal irritation (guarding, rigidity and rebound tenderness) by preventing the inflamed organ from contacting the peritoneum. Due to increased white blood cells that naturally occur during pregnancy, leukocytosis is not helpful in identifying acute pathology. A relative increase in blood volume can delay the development of tachycardia and hypotension in the truly ill patient. Consider appendicitis in the patient complaining of typical signs and symptoms of appendicitis even if confounded by right middle and upper quadrant abdominal pain, pyuria, urinary symptoms and subtle signs of peritonitis. HELLP syndrome is managed with blood pressure control, prevention of seizures, correction of coagulopathy, and delivery of the fetus. Radiological investigations, including abdominal plain films, can be safely undertaken during pregnancy and should always be considered so as to avoid delays and failures in diagnosing potentially life-threatening conditions. Diegelmann L. Nonobstetric abdominal pain and surgical emergencies in pregnancy. Emerg Med Clin North Am. 2012 Nov;30(4):885-901. doi: 10.1016/j.emc.2012.08.012. Brooks D.: Gallstone disease in pregnant women. Wolters Kluwer Health, 2012. Chandraharan, E., Arulkumaran, S. Acute abdomen and abdominal pain in pregnancy. Obstet Gynaecol Reprod Med. 2008;18: pp. 205–212. Lew M, Klonis E. Emergency Management of eclampsia and severe pre-eclampsia. Emerg Med (Fremantle). 2003 Aug; 15(4):361-8. Calhoun DA, Oparil S. Treatment of hypertensive crisis. N Engl J Med. 1990 Oct 25;323(17):1177-83.